Cables or power cords are free from breaks or tears. We will help to resolve any issues quickly and fairly. Unit is not missing parts ( power cord not included.). Peripheral Device Answer Y, N or NA. Whatever we can’t use, we recycle. Whether you need to increase, reduce, or inventory your used IT assets, RecoverIT Recycling can provide the service and products for you. Heatsinks Server Rails Networking. These power supplies were pulled from a server cabinet filled with Dell Poweredge 2950 servers. These power supplies are great for many uses! M076R JU081 Y8132. No other accessories, hardware, or software are included. All Power supplies have been tested. This item has been tested and is in working order. Good working unit!. Excellent Condition. Pulled from a working unit. Part Number: JU081. Max Output Power: 750W MAX Output. Genuine OEM DELL PowerEdge 2950 Server. MPN: M258D. Output Power: 750W. Credit Cards. May need a photo or 2, but will do everything possible based on your preference to either replace or RMA the item quickly. Item pulled while in service, reset to defaults and is still in good working condition. This includes software/driver discs, mounting hardware, cabling, power cords, power adapters, etc. DO NOT include tech support. USA Warehouse. If a correct phone number is not provided, we will cancel the order. Overall condition is GOOD. We will do our best to help you out. These Power supplies were pulled from working servers. Can be used in a PowerEdge server or may also be used in powering miners for Bitcoin, Ethereum or other forms of altcoins. Manufacturer: Dell Computers. (Model Number: Y8132. 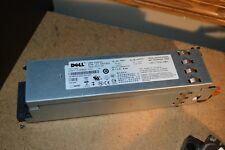 Condition Detail Genuine Dell PowerEdge 2950 Power Supplies Y8132.Tested.Sku199413. Manufacturer DELL. 5) 100% Authentic and genuine products. The unit underwent full testing, and passed tests for key functions.